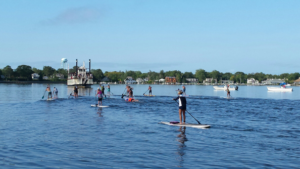 The Greater Toms River Chamber of Commerce is hosting its 2nd Annual SUP the River 2017 fundraiser on Saturday, September 16, 2017, at the Toms River Country Club. A portion of the proceeds will benefit the Barnegat Bay Partnership* at Ocean County College. So grab your paddleboard and come out to support the Greater Toms River Chamber of Commerce and the Barnegat Bay Partnership at SUP the River 2017! This family-friendly event (#WeAreTR) will be held rain-or-shine and includes a Fun Paddle/Sprint, a 2-mile race (ages 13+), and a 6-mile race. For additional event information and to register, please go to: www.paddleguru.com/races/SUP theRiver2017.